Shape factors are used as given in Adhikari 2012. A new cfg-param "use_shape_factor" is introduced. Needs further tests and eventually adaption in forward model. Changed default value for param "use_shape_factor" from True to False. Changed one comment/TODO in inversion routine. Thanks so much! This already looks very good. I have a few minor comments only. maybe some application test at HEF? I think we should rename it to use_shape_factor_for_inversion. It is likely that we will want to separate between inversion and dynamical model's factors. Yes, I already also thought about an option like this, but just did not spend more time on it. Will do so. 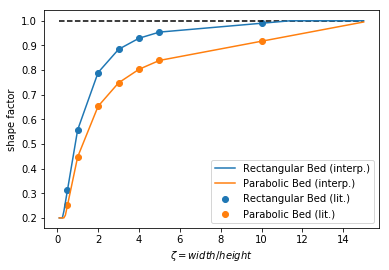 I'm not sure to understand: wouldn't it be better to return a factor of 1 when the bed is rectangular in this case? I could not really find any information on the assumed bed form in the paper. Therefore I did not go into too much detail yet. But you're right, I will adapt it this way. the factors suggested for sliding? In case is_rectangular is of type integer, these integers (0/1) are directly interpreted as indices, which is not what is intended here. In case of floats I have to admit that I did not check. Sorry, my mistake. Did not realize I was inside the function. sf_tol = 1e-2 # TODO: better as params in cfg? Already looks quite ok, i would say? Implemented suggested changes from pull request. Move this to top of file? # Do you want to use shape factors to account for lateral drag? # Allowed is empty, "Adhikari", "Nye" equal to "Adhikari" or "Huss"
@phigre should we merge this as is and add the tests at a later stage or are you still working on this? Currently, the shape factor methods of the inversion module are used for the calculation of shape factors. Ah, and don't forget to acknowledge your work in whats-new.rst ! Staggered shape factors need to be computed to match with thick_stag and u_stag. I decided to use shape factors from the unstaggered grid and combine upstream and downstream shape factors to obtain staggered values. Directly computing shape factors on the staggered grid would make an additional width_stag necessary and the question arises what is_rectangular_stag would look like. I referenced the shape factor functions from the inversion module. IMHO, having them in a separate dedicated module and referencing this module from inversion and flowline would make more sense in regards of code structure. Yes, probably. It could be added to utils for now (and the test moved to test_utils for now, even if the utils module is definitely overcrowded and could need a split-up one day. What do you think? Fixed bug for sf_func call in flowline, when sf_func was not set. Moved shape factor calculation to utils. Using a proxy variable `use_sf` instead of `cfg.PARAMS['use_shape_...']`. This variable is set to None, if the acquired key is not found in PARAMS. There are still some issues like the storage of sf_stag in self._stag and how to handle not set fl.is_rectangular (yes, that is possible), which I didn't want to decide on my own. Otherwise ready to merge now? …s. Moved shape factor function choice to init of class. Added tests with shape factors for inversion and FluxBasedModel doing a roundtrip. Tests for each case would probably be much better with one single callable function and write wrappers, which are actually called for testing and set the shape factor mode before calling the function. shape_factors[heights <= 0.] = 1. This is a brilliant piece of work, thanks a lot! I will merge this now, we can always go back to some details later. Experience shows that the global applications will require some tuning, but I'm eager to test this out. Note that this probably should become the default some day.